can be added, removed, and repositioned within the navigation. 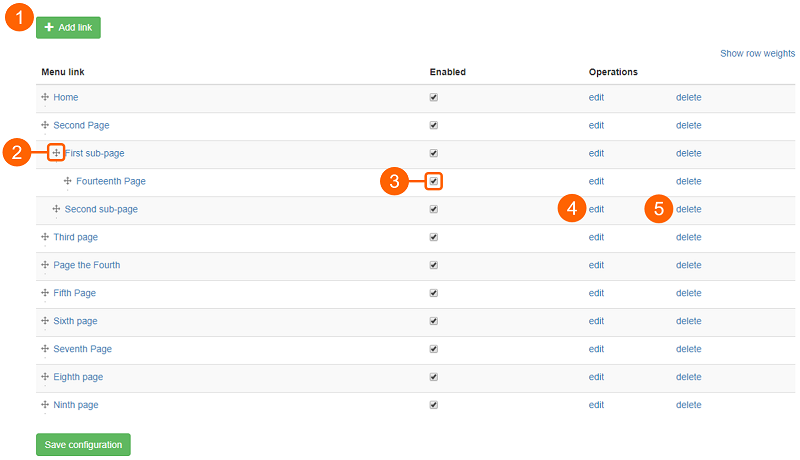 Click on 'Save configuration' to go back to Site Settings > Navigation. Use the 'Menu settings' screen in the edit mode of the page you intend to link to the navigation (see Page Editing). This is the recommended way to configure a navigation link. Use the 'Add link' function in the Main menu screen (in Site Settings > Navigation). This functionality is documented here. Clicking on the 'Add link' button on the Main menu configuration screen will open the link administration screen. Input the path to the page. This must be given in the form 'node/[node ID]'. 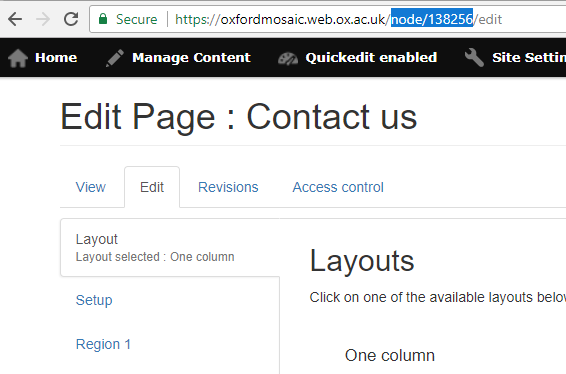 To find the node ID, go to the page that will be linked, enter edit mode, and copy the 'node/[number]' portion of the URL (see below), then paste this text into the 'Path' field. 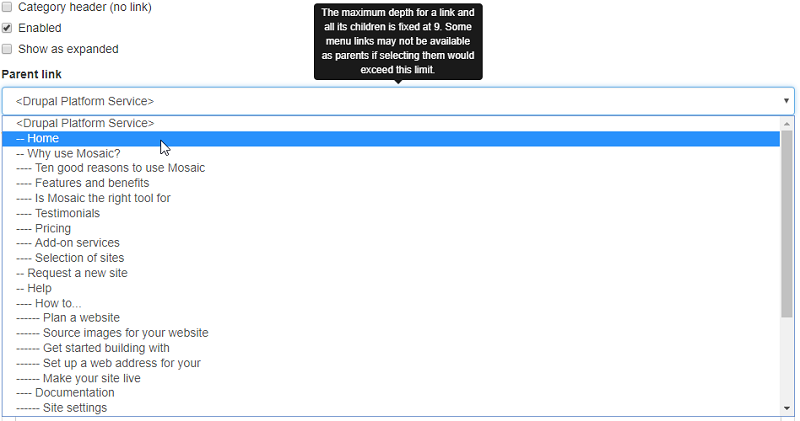 Select a position for the link in the navigation structure by identifying its parent link. If the link is for a top-level page, the parent link will be the site title (the item in angle-brackets in the 'Parent link' dropdown list). Click 'Save' (the other fields on the form are not mandatory and can be ignored). Drag and drop links to where you want them to appear in the navigation structure. To change the position of a link, click and hold the multi-direction icon to the left of the link title (2), drag the link to the desired position in the navigation structure. When in position, release the mouse button. The level of the link in the navigation hierarchy can be changed by dragging the link horizontally to indent its position under the desired parent item, e.g. 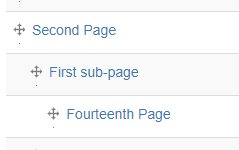 below, 'Second Page' is a top-level link; 'First sub-page' is a second-level link; 'Fourteenth Page' is a third-level link. When a navigation link is created, it is enabled by default. If a link needs to be removed from the navigation temporarily (and be reinstated in the future), it can be disabled using the 'Enabled' checkbox (3). A navigation link can be edited using the 'Edit' function (4). Clicking this feature will open the administration page for the link. The 'Delete' function (5) allows users to delete links from the navigation.